HOW MANY PLAYERS ARE ALLOWED ON A TAGRUGBY.IE TAG TEAM? To play Tagrugby.ie TAG, you must be part of a team. A team is made up of seven people on the pitch at any time with at least three of these being female. Each week, you can register and sign up a maximum of 14 players, meaning you can have 7 players on the pitch and 7 subs. We have found that the best combination of 14 players each week is 8 guys and 6 girls but, of course, you can alter this according to the players available to you! Remember you will also need to cover for when people are unavailable due to on holidays or work commitments, so we recommend you should have a number of extra players you can call on when numbers are tight. CAN I PLAY TAGRUGBY.IE TAG IF I DON’T HAVE A TEAM? If you are an individual who is not part of a team but is interested in playing Tagrugby.ie TAG, our "Find a Team" service is just for you! It is essentially your chance to either advertise your skills (both athletic and social!) to teams who may be looking for players, or to be placed on a team with others who are also looking for a team to play with. For a fee of just €71(Summer) or €50 (Other), we will try and find a place for you on an existing team or create a new team for you and other "Find a Player" subscribers. This fee includes the service of placing you on a team, as well as covering your contribution towards the team registration fees. You can also find a list of individual teams, which you can join, competing in different leagues through our website. WHAT SHOULD I DO IF I WANT TO START MY OWN TAGRUGBY.IE TAG TEAM? Ask your work colleagues. 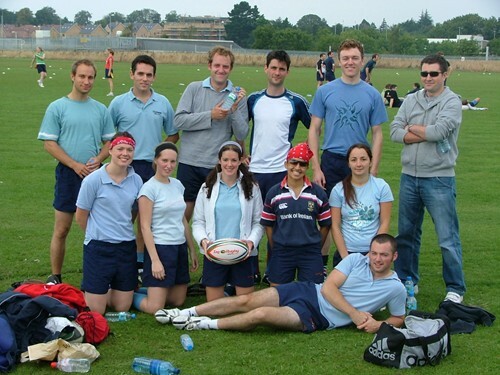 A large number of Tagrugby.ie teams play with their company's backing and support. Tagrugby.ie Tag is a great team building exercise and an excellent way for everyone to get out of the office once a week for a bit of fun and socialising and some healthy sporting action. Ask your friends and family. Tagrugby.ie Tag is a great way to meet up with old friends from school or college on a regular basis. And because you are taking part in an outdoor, social activity, you will all benefit from a fitness point of view as well! Plus, you can head into the Official Social Venue after the game to discuss the match and catch up on old times! Ask your teammates from other sports. In recent years, various sports teams (such as rugby, soccer, Gaelic football, hurling, basketball, hockey – even water polo!) have played Tagrugby.ie tag to keep them in shape during their off-season. Check out individuals looking for teams on the Tagrugby.ie website. Look in the "Find a Player" section of the Tagrugby.ie website to see who is currently looking for a team. Identify a player who you would like to recruit and send them a message. HOW CAN WE FIND EXTRA PLAYERS FOR OUR TAGRUGBY.IE TAG TEAM? If you are looking for extra players – for example, you are short one week due to some players going on holidays - go to our Facebook page (www.facebook.com/tagrugby) and post a recruitment ad stating exactly what you are looking for (male or female, what venue, what night etc). Hopefully you will get some responses and then be able to recruit these people onto your team. CAN I PLAY FOR MORE THAN ONE TAGRUGBY.IE TAG TEAM? YOU CAN ONLY PLAY ON ONE TEAM PER NIGHT/DAY PER VENUE. Sometimes, a very good player is 'borrowed' for a vital game, which makes a big difference to the result and is against the 'spirit of tag'. In order to protect honest teams, each player may only register for ONE team per day/night per venue, REGARDLESS OF GRADE. If a player is caught playing on more than one team, ALL teams that person has played for that day/night will be penalised. if playing a new player, ensure that player has not already played for another team at your venue that afternoon. If your team is stuck for players, please follow our recommendations and search for players in the “Find a Player” section. WHAT EQUIPMENT DO I NEED TO BRING WITH ME TO PLAY IN A TAGRUGBY.IE / I.T.R.A. EVENT? · Footwear. As a general guide, the best footwear is boots as they are good on both dry and wet grass. Runners are OK but may be too slippy for the wet conditions. However certain venues have specific rules & regulations regarding what footwear is permitted, so ensure you've checked in advance of playing. · Eye Protection (if necessary). Despite Tagrugby.ie TAG being a non-contact game (with no scrums, tackles or line outs), when playing such a team sport, there is bound to be some contact made between players. For these reasons, eye glasses and sunglasses are not allowed while playing, and for the health and safety of all tag players, this rule will be strictly enforced. If you do need corrective lens, please wear either contact lenses or prescription polycarbonate goggles, which have been designed especially for sports use. All eye protection should fit securely and have cushions above your eyebrows and over your nose. Click here for Health and Safety information. · Team Kit. We recommend that your team all wear the same coloured t-shirts/tops as this makes it easier for players and referees to distinguish between teams. WHERE CAN I BUY ITF-APPROVED TAG SHORTS? ITF-approved Tag Shorts can be purchase on the Tag Rugby Sports website (www.tagrugbyshop.com). These unique shorts (with Velcro on the sides) are specifically designed for safety and quality of play. HOW DO I APPLY TO BECOME A REFEREE AT A TAGRUGBY.IE EVENT? We are constantly looking for new people interested in getting involved on the refereeing side. Remember that referees can actually play and referee on the same day/night. All referees are paid for each match they look after. Therefore it can be a great way for you to save some money over the season for a holiday etc. If you are interested in becoming a referee, simply click here. HOW LONG DOES A TAGRUGBY.IE TAG SPRING OR SUMMER LEAGUE MATCH LAST? An Tagrugby.ie TAG match is forty-five minutes long. Each half is twenty minutes with a five-minute half-time break.? HOW DOES THE SCORING WORK IN TAGRUGBY.IE TAG? A try is scored when the ball is placed on or over the try line. There are no conversions. A try is worth one point, except in the Mixed Social League where a female try is worth three points. Involving the female members of your team is therefore essential for success in Tagrugby.ie TAG. HOW BIG IS A TAGRUGBY.IE TAG PITCH? An Tagrugby.ie TAG pitch is between 45 and 50 metres wide and 65 to 70 metres long. Typically a Tag pitch is played across a full-sized rugby, soccer or GAA pitch, making two tag pitches on a full-sized pitch. No posts are necessary. WHAT IS THE DIFFERENCE BETWEEN TAGRUGBY.IE TAG AND TOUCH RUGBY? · Tagrugby.ie TAG shows clearly and definitively when a tackle has been made and therefore prevents arguments. · It gives a real incentive for defenders to defend. 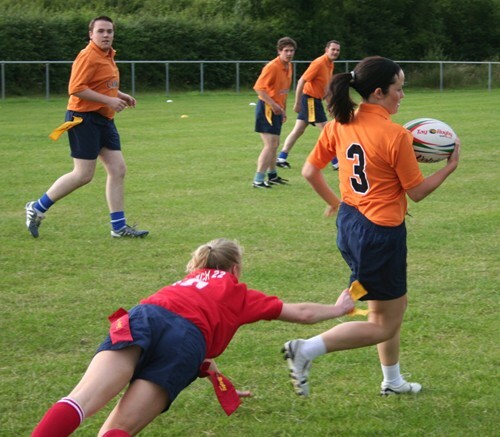 · Tagrugby.ie TAG encourages the correct lines of running required for Rugby Union. WHAT HAPPENS IF MY TEAM IS LATE FOR OUR TAGRUGBY.IE TAG MATCH? Each team must have a minimum of four players on the field to start play. In the case of the Mixed League, three out of those four players must be female. One point is added to the opposition for every minute the game is delayed, starting from the referee’s whistle. If after five minutes your team has not arrived, you forfeit the match. HOW CAN AN TAGRUGBY.IE TAG GAME BE FORFEITED? Your team runs the risk of forfeiting their match if any of the following incidents occur. Incorrectly filling in Team Registration Form. Each player’s name should be registered online in advance of matches. Not enough players. You need to have at least four players on the pitch at all times. If you are playing in a Mixed League at least three of these players must be female. Arriving late. You cannot arrive later than five minutes after the referee starts the game. A team not showing up. Too many players. Only 14 players can play each match. Illegal Players for Finals Day/Night. Tagrugby.ie TAG Spring League. Players can only play for your team on Finals Day (Week 6) if they have played at least two matches for your team between Week 1 and Week 5. Tagrugby.ie TAG Summer League. Players can only play for your team on Finals Night (Week 9) if they have played at least three matches for your team between Week 1 and Week 8. Ineligible player. You can only play for ONE TEAM PER VENUE PER AFTERNOON/NIGHT. Suspended Player. Anyone who receives a red card in a previous game and is currently serving their match suspension is ineligible to play. Anyone else associated with the event. This is at the discretion of Tagrugby.ie.?? WHAT IS THE FINAL SCORE IF A TEAM FORFEITS A MATCH? WHAT HAPPENS WHEN A PLAYER IS RED CARDED DURING THE KNOCK-OUT STAGES? If a game is tied at full time in the knock-out stages of an Tagrugby.ie event, any team who has had a player red carded in the match (or has had more players red carded in the match than their opponents) will be deemed the loser. This is in addition to any scoring penalties resulting from the red card(s). WHO IS ELIGIBLE TO PLAY FOR MY TEAM ON FINALS DAY/NIGHT? In order to qualify to play in the Tagrugby.ie TAG Spring League Finals Day in Week 6, each player in the squad must have registered and played at least two tag games for that team between Week 1 and Week 5. In order to qualify to play in the Tagrugby.ie TAG Summer League Finals Night in Week 9, each player in the squad must have registered and played at least three tag games for that team between Week 1 and Week 8. AM I COVERED BY INSURANCE IF I GET INJURED PLAYING IN A TAGRUGBY.IE EVENT? Tagrugby.ie Tag Rugby is a non-contact sport, but as with all sport, there is a risk of injury. As every Tagrugby.ie Tag player has different insurance needs, it is the decision and responsibility of each player to ensure they are fully covered in accordance with their specific requirements when participating in Tagrugby.ie Tag. Tagrugby.ie strongly recommends that each player has their own Personal Accident Cover in case of an injury. You can purchase a Personal Accident Cover policy from any financial consultant or insurance broker. Before playing in any Tagrugby.ie TAG event, each player must also print and sign their name on the Team Registration form. All players use the services of third party organisations at Tagrugby.ie Events at their own risk. WHERE CAN WE SEND OUR TEAM PHOTOS FOR THE ONLINE PHOTO GALLERY? WHAT SHOULD I DO IF I NOTICE AN INCORRECT SCORE FOR MY MATCH ON THE WEBSITE? If your team would like to query the result of a match, you should contact info@tagrugby.ie within one week of the match in question. Once the week period has passed, we will not be in a position to change match results. For teams who play tag with us year-round, we have introduced a loyalty system whereby your team accumulates points for each I.T.R.A. Tag event you register for. These points can then be used to get money off Beach Tag events, Autumn / Winter Leagues etc. When you log into your team account, you will see the number of loyalty points you have accumulated, which you can then trade in when you are making your next purchase. Think of it like a Tesco Clubcard for I.T.R.A. Tag! HOW DO I REGISTER A TEAM FOR A TAGRUGBY.IE LEAGUE? HOW DO I REGISTER FOR A TAGRUGBY.IE EVENT? 1. Log on to www.tagrugby.ie. 3. Then Select your City in a drop-down menu. You will then see the venues and season that are available in your city. 4. Click on the venue you require, see what places are still available and the click on "Register" for the grades you want to play in. 5. Enter your team name, followed by your team’s details as requested. Please make sure you enter a valid email address for the captain and vice-captain. They both should have regular access to email, as they will receive important information from us about the tournament you have registered for. 6. Enter your payment details. You can pay by cheque, credit or Laser card or by instalments. 7. Click "Pay Now" when you have everything filled out. 8. At first, you will receive a “Pending Email” from us, explaining that we received your registration but need to process your payment before your team place can be confirmed. When we get your payment, and process it, we will send you a “Confirmation Email” (subject to availability), confirming the venue and grade you have registered for. Only at this stage is your team place guaranteed for the ITRA Event. 9. Make sure you register your team early to secure your place in your desired tournament. WHAT DO I NEED TO REGISTER A TEAM FOR AN TAGRUGBY.IE EVENT? · If you're playing in a Mixed League, you'll need at least 3 females on the pitch at all times. · Contact details for the Captain and Vice-Captain. Both should have regular access to email, as they will receive important information regularly from us by email about the Tagrugby.ie event you have registered for. · Team name, which can often be the hardest bit! The name must be less than 20 characters. Remember that team names are live on the Tagrugby.ie website and the tournament may be covered by local and/or national media so it should be suitable for a family audience! We therefore reserve the right to ask a captain to choose an alternative team name if we decide the original one is inappropriate. · Registration fee. You can pay by cheque, credit or Laser card or by instalments. If you have any queries about your registration, simply contact us on +353 1 20 20 100 or email info@tagrugby.ie. · Cheque. Please make payable to ITRA and send to 5 Rogan’s Court, Patrick Street, Dun Laoghaire, Co. Dublin. · Instead of paying your registration fee up front at the start of the year, when money may be tight after Christmas and New Year celebrations, you now have the option of paying your registration fee in two fixed instalments – A deposit up front and the other by 1st May (outstanding amount). · Or you can now pay your deposit and instead of you chasing up your team mates for payment you can now just send them on a link where they can log into your team account and make their payments themselves. The Captain will be notified as each team member has completed their payment. WHAT ACCOMMODATION IS AVAILABLE AT TAGRUGBY.IE FESTIVALS? Wherever possible, we will provide you with a list of discounted accommodation for each Tagrugby.ie Festival. Please note though, that it is the team’s responsibility to secure their own accommodation for Tagrugby.ie Festivals.